Indian Election Commission conducts elections every five years to elect MPs and MLAs for the Parliament and various State Assemblies. The media hype dies down, after the elections are completed. Unless there are some big issues or chaos in the Houses, neither the media nor the general public give serious attention to the performance of the elected members. This process goes on for ever and the media hype starts when the next elections are announced. PRS Legislative Research is a non profit research body at Delhi established in 2005. They conduct various researches on the bills, questions, debates of the Parliament and various state Assemblies. They also periodically put out their analysis in their website. While, US and UK have many such research bodies to analyse the performance of Legislatures, India has only one such research body. 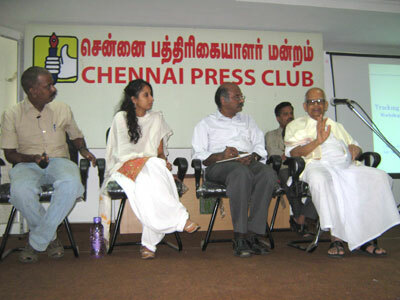 Chennai Press Club and Prime Point Foundation jointly organised a workshop on 24th July 2010 for working journalists at Chennai to create awareness about the tracking of the performance of MPs and MLAs, with the support of PRS Legislative Research. The workshop was inaugurated by the veteran and well known Parliamentarian Mr Era Chezhian. During his inaugural speech, he expressed concern over the reduction in number of sittings of Parliament during the past few years. Before 1980, the Parliament used to meet for 120 days every year and now it has come down to around 60 days. Mr Chezhian was also expressing his concern over the suppression of freedom of press by many Governments. Please watch and listen to the presentation made by Ms Tonusree on the various aspects of tracking of legislators. Please click to play the video. Please watch the photographs taken during the occassion.